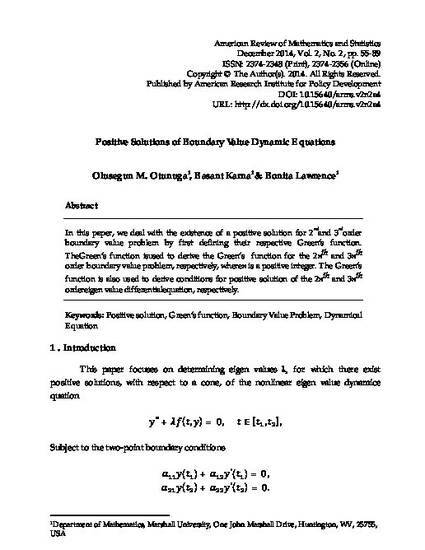 In this paper, we deal with the existence of a positive solution for 2nd and 3rd order boundary value problem by first defining their respective Green’s function. The Green’s function is used to derive the Green’s function for the 2nth and 3nth order boundary value problem, respectively, where n is a positive integer. The Green’s function is also used to derive conditions for positive solution of the 2nth and 3nth order eigen value differential equation, respectively. The copy of record is available from the publisher at http://0-dx.doi.org.library.simmons.edu/10.15640/arms.v2n2a4. Copyright © 2014 The Authors. All rights reserved. Otunuga O. M., Karna B., & Lawrence B. (2014). Positive Solutions of Boundary Value Dynamic Equations. American Review of Mathematics and Statistics, 2(2), 1-6.